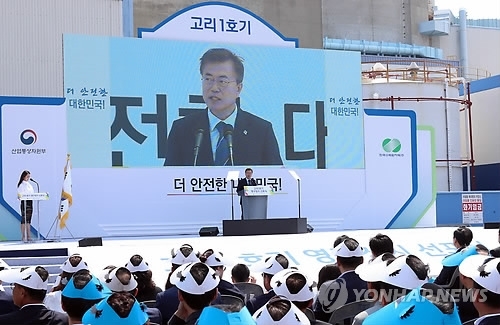 SEOUL, July 19 (Yonhap) -- South Korea aims to generate 20 percent of its electricity with clean, renewable energy by 2030, while reducing its reliance on fossil fuel and nuclear power plants, the new Moon Jae-in administration said Wednesday. By 2023, the government will require power utility firms with a generation capacity of 500,000 kilowatt or more to generate 10 percent of their electricity using eco-friendly, renewable sources, according to the policy outline. The so-called Renewable Portfolio Standard (RPS) system mandates power utility firms to generate a certain amount of electricity with renewable energy. Under the RPS system, the proportion of electricity generated by renewables could rise to as high as 28 percent by 2030, the report said. For small-sized power generators, the government will purchase electricity from them at a fixed price, the advisory committee said. By 2020, all government and public organizations will be required to build in-house solar energy storage systems that can make better use of electricity generated by the sun. In addition, Asia's fourth-largest economy will make a determined push to build infrastructure for an environmentally sustainable, "smart" energy supply. To transform the nation's low-cost and high-efficiency energy policy into something geared to better preserve the global ecosystem while also being highly efficient, the government will move to strengthen energy-efficiency standards for industrial machines equipment starting next year. Last year, renewable energy accounted for just 3.6 percent of the nation's electricity. Moon had campaigned to suspend construction of new nuclear reactors and coal-fired power plants, saying he would take steps to transform South Korea into a nuclear-free country. Public perception towards nuclear power soured here after the partial nuclear meltdown at Japan's Fukushima Dai-ichi plant in March 2011. The incident caused vast areas of land around the nuclear power plant to be abandoned with environmentalists claiming the incident is the worst disaster to occur on the planet in decades. Speaking at a ceremony in June marking the closure of the 40-year-old Kori No. 1 nuclear reactor, Moon said, "Nuclear power generation was the choice of our energy policy at a time when Korea was developing and had to import most of its energy needs." "However, now is the time for a change. The country's level of development and its structure has changed, and there is growing awareness in regards to the importance of the environment. An understanding that the lives and safety of the people are more important than anything else has been firmly established as a social consensus," Moon stressed. Last month, the government also suspended construction of two partially completed nuclear reactors, despite opposition from critics who have voiced concerns that getting rid of nuclear power will adversely impact the heavy industry-centered economy and raise electricity bills going forward. The decision to halt construction is seen as a reflection of resolve by the government to transform South Korea into a nuclear-free state.